Archibald Mclellan, the founder of the McLellan Galleries, was born in Glasgow in 1795. His father’s business was as a coach-builder and was situated on a large open space fronting Queen Street and Miller Street. He did go to University although it was still the intention that he follow his father’s occupation. He distinguished himself as a heraldic draughtsman, became a partner in the coach-building business and was appointed Deacon of the Incorporation of Hammermen. He became a Magistrate of the city when only twenty-five years of age. 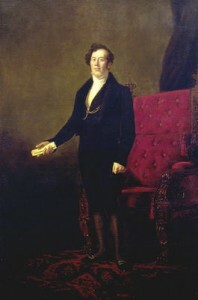 He was appointed Deacon-Convener of The Trades’ House in 1831 – an office which he held for two years, during which period he succeeded in securing for the Deacon-Convener and the Dean of Guild the position of Town Councillors ex offico, an honour which was proposed to be taken from them under the Burgh Reform Act. The members of the Trades’ House marked their appreciation of his services by re-electing him for another term in 1834, and placing in the Trades’ Hall his full-length portrait, painted by his life-long friend, John Graham Gilbert (memorial in the Necropolis). 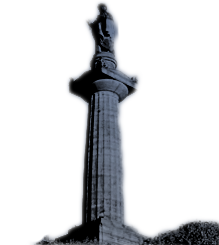 McLellan was committed to the promotion and improvement of Glasgow, especially in arts, architecture, sculpture, painting, and music. No one can doubt his desire to improve the architectural appearance of the city. However not everyone agreed with his improvements during the restoration to Glasgow Cathedral especially the removal of the Western Tower and Consistory House. He was the first to suggest a new western approach to the Cathedral, and acquired the ground between Weaver Street and Stirling’s Road, which was ultimately transferred to the municipal authorities and the Merchants’ House. A patron of the Fine Arts he enjoyed the friendship of Sir David Wilkie, Sir Francis Chantrey, Sir Daniel Macnee (memorial in the Necropolis), R. A. Smith, William Motherwell (memorial in the Necropolis), and most of the distinguished painters, sculptors, musicians, writers of his day. He purchased paintings and sculpture of the highest class, which along with his fine library, and his collection of gold and silver plate, he bequeathed to the city. At the time of his death, various investments and the erection of the galleries in Sauchiehall Street, incurred debts to the banks and his intention of bequeathing his whole property for the benefit of art was frustrated. However, this was an opportunity for forming the nucleus of an Art Gallery for the city and the Town Council acquired the Sauchiehall Street buildings, with the pictures, sculpture, and other works of art, for the sum of £44,500 (equivalent to £2,187,620 in 2007). This was a controversial decision but the value of the McLellan Collection far exceeds what was paid both for the property and the pictures and whatever the difference of opinion may have existed at the time there can be no question as to its value to the city of Glasgow. Mr. McLellan died at Mugdock Castle, a favourite residence of his during the summer months, on the 22nd October, 1854, aged 58. More might have been written about McLellan at the time of his death, but Britain was in the throes of the Crimean War – newspaper space was taken up on the day his obituaries were printed with accounts of the Battle of the Alma. His funeral, by his own request, was to be quiet and private. He was buried in the Cathedral cemetery, but due to re-locations there, his grave was marked only by a number. However, in June 2004, a Memorial Trust organised by interested citizens accumulated funds to erect a Memorial stone in the Necropolis Graveyard, on the slope facing appropriately towards the Cathedral. It was designed and erected by Mossmans. 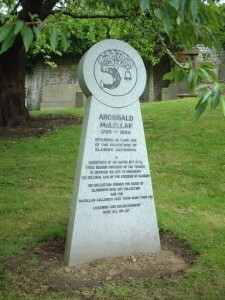 The Lord Provost unveiled the memorial, and paid tribute to McLellan’s achievements.